Yes, the words are large—but better yet, the back cover is very stiff, so you can fold it open and easily work a puzzle on the bus, a sofa, even in bed. 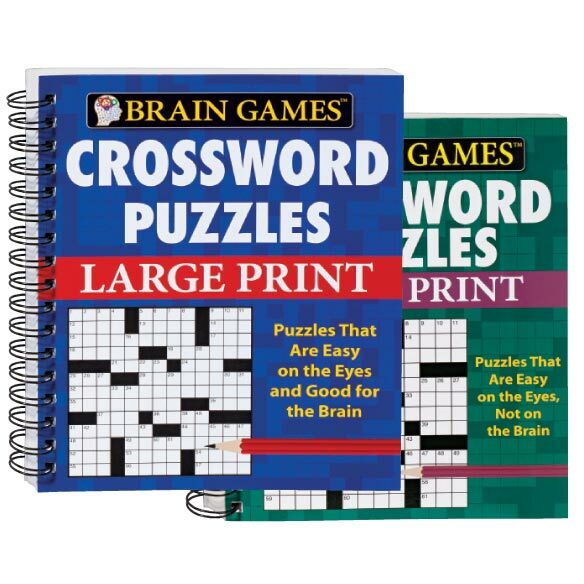 125 puzzles with answers; wirebound to lay flat. 192 pages. 7 3/8" x 9 1/8. These were also a gift for my mother. She loves them. These really have some good challenges for the brain, she loves them. Wants more! The puzzles are entertaining and a great way to pass the time on a trip. The large print helps to see even in low light. This is the 2nd time I've given as a gift and the receiver was very happy as she is a crossword fanatic. this was very confusing. I am elderly. I love doing crossword puzzles! Hard to find large print crossword puzzles. So glad I found these. I love to do crossword puzzles, and now I need the large print. I'm always up for a challenge. This is one of my hobbies. My mother loves the large print crossword puzzle books. The large print format will be easy for my elderly aunt to read. Looks like lots of entertainment for my vision impaired Mom who loves crossword puzzles. Need large print and the hard covers makes it easier to work while sitting or laying down. Love crosswords + vision problems. Solved with these books. What is the difficulty level? BEST ANSWER: About medium hard I’d say. I have first version. want second version ? BEST ANSWER: Thank you for your question. At this time we do not have the second version. We apologize for any inconvenience. I have first version. want to order second version. Do you get both books for 14.99, as 2 books are pictured on the page? BEST ANSWER: Thank you for your question. This is one book for $14.99. We hope this information will be of help to you.